The triceps are one of the most noticeable muscles on any bodybuilder. Getting big triceps should be the goal of any potential bodybuilder. The triceps are one of the most noticeable muscles on any bodybuilder, and considering that they make up the majority of your upper arm, getting big triceps should be the goal of any potential bodybuilder. In this article I want to talk about how to get the "big tris" that will make anyone proud. As the name suggests, the triceps are made up of three different muscles, and in training the triceps one needs to pay attention to hitting each specific part of the triceps. Most triceps exercises can be grouped into three categories: movements for overall mass, movements to hit mainly the upper triceps, and movements that hit mainly the lower triceps. One needs to also remember that anytime any type of pushing movement is done, from bench press to pushups, the triceps are involved. This is why many people like to train triceps on their chest day, since the pushing movements done for chest get the triceps warmed up. Of course, they can also tire your arms out and therefore I also like to do arms on their own day sometimes. You just have to find what works best for you. So how do you get those massive "horseshoe" shaped tris? The key is to hit all three parts of the triceps, so that they not only grow but separate as well. The best way I have found is to mix one movement from each of the three categories I mentioned above: one movement that hits all three parts of the triceps for overall mass, one for the upper triceps, and one for the lower. Although the triceps are a pretty large muscle, I feel that you should not do anymore than ten sets at the most for tris. 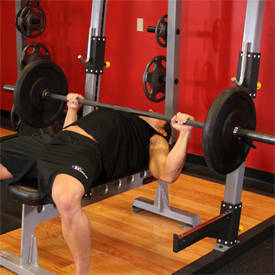 An example of exercises for overall mass includes close-grip bench press, weighted dips, and triceps extensions. Form, as always, is important. For the dips, make sure you don&apos;t lean to far forward, as this makes it more of a chest movement. Slowly go down, then rise up but don&apos;t lock your arms out to keep pressure on the triceps the entire time. Remember to do each set with as much weight as you can do for that many reps. Your arms will feel like rubber after that workout, and your tris will start growing in no time. Of course, there are almost endless variations on these exercises. You can do the triceps presses (also sometimes known as French presses) standing up if you prefer. The same goes for the extensions. Some people like to do them seated, others standing up. For the dips, you most likely will want to start doing them without weight, especially to get the form right. Dips can put a lot of stress on the elbows. Eventually, you&apos;ll probably want to get a weighted dip belt and start doing them with weight. Or you can hold a dumbbell between your feet. Some people can do that, other cannot. The point is to find what works best for you, and experiment with it until you find something you really like. Then when you find it, do it for a few weeks then switch it again. As with any muscle group, hit the triceps differently almost every time. As soon as you can start doing each rep easier, don&apos;t hesitate to increase the weight. The triceps are one of the most visible muscle groups, and they will go a long way to making your arms bigger. With the guidelines I&apos;ve outlined here, you&apos;ll be adding mass to your arms like crazy. Good luck and email me with any questions.